The Canadian coast is all about natural beauty, and Richmond is at the center of it all. Whether you plan to attend festivals near the ocean or stay home and enjoy quality time with the family outdoors, SYNLawn knows how important it is to have a safe, beautiful environment. 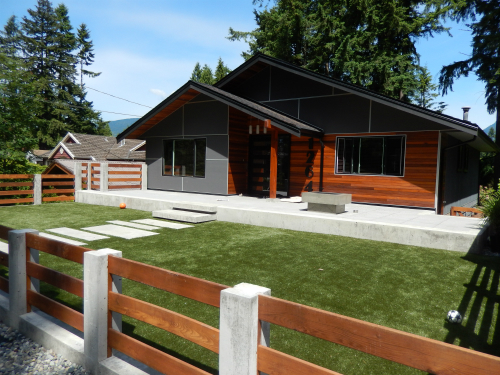 Our artificial grass not only provides eco-friendly landscaping solutions throughout British Columbia, but it also creates stunning spaces for homeowners and businesses to enjoy year-round. Our environmental practices only improve the quality of our artificial surfaces. We use renewable resources such as soybean oil to create some of the most durable artificial grass in the industry. Post-manufacturing waste like coal ash is also used to add additional strength and stability. Our turf is projected to have among the longest life cycles in the industry and is completely recyclable. Now that’s a purchase you can feel good about! It’s easy to work artificial grass into your existing landscape. Our team of designers will come to your home or place of business for a complimentary on-site evaluation. We will look at any property plans and existing structures so we can design a landscape that works for you. Choose from a variety of turf products, including backyard putting greens, playground surfaces, pet grass, athletic turf, and pour-in-place surfaces. Our team will professionally install your turf so you can enjoy high-quality results that last. 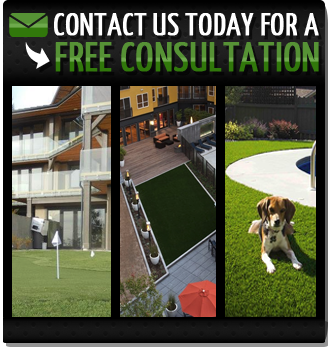 SYNLawn Vancouver is dedicated to beautifying British Columbia with artificial turf that is just as good for the planet as it is for your wallet. Contact us today to request samples or schedule your free consultation.